The following story and photos are by Sarah Keller for the Intermountain West Joint Venture. On an overcast fall afternoon in southwest Montana, nearly two dozen land managers and conservationists are gathered in the sagebrush around a vertical face of eroding soil. During spring runoff, wet meadows like these green up and become a vital food source for wildlife. But as livestock and people create trails through these broad catchments, among other factors, the trails erode into deep gullies and headcuts like the one the group is observing. It’s a problem here in Montana, as well as around the West. “With a headcut such as this one, if you don’t treat it, it’s going to keep going,” said Bill Zeedyk, as he gestures at the exposed earth with a walking stick. “There’s no natural process to stop it. You have to be proactive.” Soon the crew surrounding him moves into action to start clearing soil away and stacking rocks. Pictured holding his iconic walking stick, Zeedyk is a riparian restoration expert here to teach Montana managers his unique methods for repairing meadows like this one in sagebrush country. In the case of this headcut, it is part of a wet meadow that begins on Bureau of Land Management public land and continues onto the private Hansen ranch. The restoration of this site means building a series of three rock steps against it to slow the flow of runoff. Like all of Zeedyk’s techniques, it’s a simple, elegant structure designed to work with water to catch sediment, and level out the meadow so runoff can spread over it again. Everyone here pitching in to stack rocks is part of a multi-day workshop learning about these habitat restoration techniques. The pervasiveness of degraded wet meadows seems like a daunting problem. But many land managers see restoring them as a conservation opportunity, particularly when the methods are simple and cost-effective, like Zeedyk structures. The availability of these mesic wet habitats, specifically the forbs and insects they support, impact wildlife like the iconic sage grouse. Restoring them will provide sage grouse with additional chick-rearing habitat, while helping other wildlife and landowners. So this mesic restoration demonstration project that Zeedyk is overseeing teaches tools that many are interested in learning. 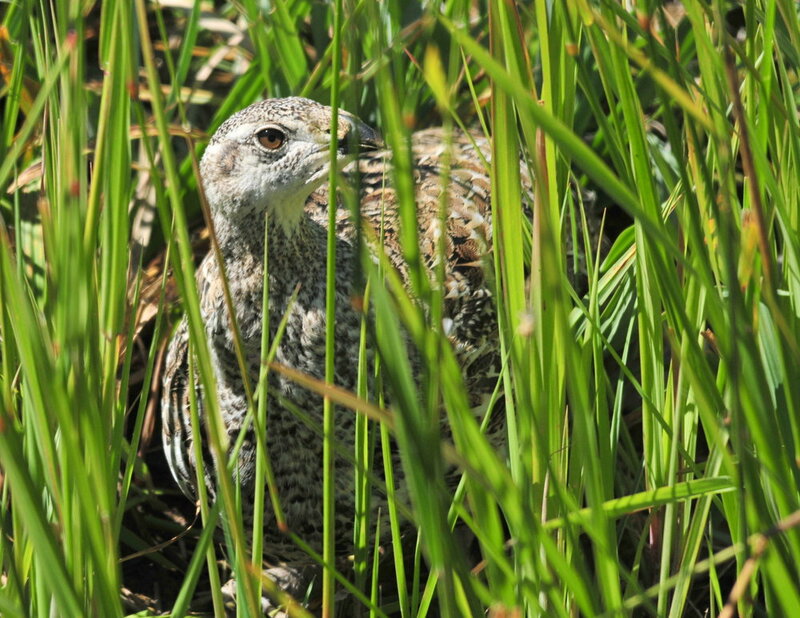 The idea to start restoring incised channels in Montana with the Zeedyk method took shape last year as Tackett and Claffey discussed how they could collaborate to improve sage grouse habitat on BLM lands in southwest Montana. In this part of their range, sage grouse do not experience many of the threats that pressure them elsewhere, like roads and housing developments fragmenting habitat or large-scale wildfires resulting in invasion of non-natives plants, such as cheatgrass. Here, their long-term population trends have been positive, and managers want to make sure they stay that way. The BLM’s Dillon field office has also made great strides in improving sagebrush habitat through grazing management by working with ranchers that graze cattle on public land allotments. But, said Claffey, they realize that continued progress means they are going to need to take a more active approach in some areas. Low-tech restoration efforts, like using Zeedyk structures or beaver dam analogs, are some of the key conservation actions the Sage Grouse Initiative suggests ranchers can take to benefit both working lands and wildlife. The Initiative is working with partners to host trainings that help spread the word. Zeedyk structures promise to be effective watershed-scale restoration tools, in part because once managers learn the techniques, they can teach large groups of volunteers to build them. Bonny Hammons, a BLM hydrologist from Lewistown attended the workshop because she has several restoration projects in mind for her area, including creating a demonstration site to inform local landowners about Zeedyk’s techniques. “You can restore public lands, but to do these watershed-scale restoration projects you have to work on public and private land,” she said. The NRCS and The Nature Conservancy have been working with the Hansen family since 2012 on rangeland assessments, enhancing water sources for stock, and weed control. They recently removed 800 acres of conifers encroaching on sage grouse habitat, and are working with The Nature Conservancy on a conservation easement. Doing wetland restoration there is another opportunity that’s mutually beneficial to rangeland and wildlife. Now that they’ve been trained in Zeedyk’s techniques and have created a demonstration site in southwest Montana, the partners will spend the winter working on a strategy to prioritize future sites for restoration. As rainclouds and thunder move in over the gully, Zeedyk critiques the group’s work on the headcut. Over a couple hours, gentle masonry steps have replaced dead grass and exposed soil. “Now we’ve stopped this headcut and preserved this land’s form. This took a lot of time but you can look back uphill and see that we’ve saved this meadow.” Then he points out one last rock that’s sticking up out of place. Someone hands Claffey a flatter one and he works it into place. “The work’s never done,” said Zeedyk. Since this demonstration project, local partners have already capitalized on their new training. Project partners have installed an additional 58 erosion control and water spreading structures at this demonstration site on both the public and private lands.